It's been ages since I've participated in the What My Child is Reading meme at Mouse Grows, Mouse Learns, but it's a new school year so I've decided to try starting off on the right foot and post a few favorites from the library each week. Not surprisingly, back-to-school themed books have been a clear favorite this week with my daughter. My daughter enjoys making up her own story when we read this gorgeously illustrated, wordless picture book. 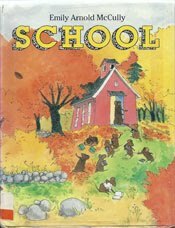 A mouse family prepares for school and all the little mouse children head off for the little red school house...all except the smallest little mouse, obviously the youngest in the family. 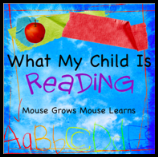 The youngest mouse ends up sneaking off to school while his mom is busy and, after a little commotion, spends part of the day helping out the teacher until mother mouse comes searching for her little lost one. The book really speaks to my daughter because she has to leave her little brother behind every day while she attends school this year. The autumn colors are beautiful and the little school house is very quaint and old-fashioned. It's not unusual to get a little jittery on the first day of school, and this back-to-school book is sure to generate smiles with its surprise ending. Sarah doesn't want to get out of bed on the first day of school. She hides under her pillow and tries to stall with a bunch of excuses. She finally makes her way to her classroom and gets properly introduced by the school principal. We read this funny book quite a few times this week, and my daughter clearly revelled in learning that she wasn't the only one who worries about school. Of all the books we read this week, this one easily won the popularity contest. Chrysanthemum, a little girl mouse, really loves her name. She skips off to school for the first time and is heartbroken when her unthoughtful classmates make fun of her flowery name. After her terrible experiences, she desperately wishes her parents had called her something else and every day walks to school dreading her day. She finally meets a dreamy art teacher who helps her realize her name is absolutely perfect. My daughter loves the adorable mice, the repetition and seeing Chrysanthemum wade her way through a difficult social situation. I love that the book helps show her that she doesn't always have to try to "fit in" at school -- being different isn't bad. 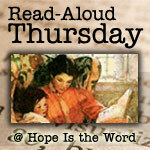 The book also demonstrates the power of words and helps her learn that what she says can have a huge impact on others. Words can hurt or they can uplift. With interesting and inventive illustrations, this is probably one of the more unusual train books we've read so far. 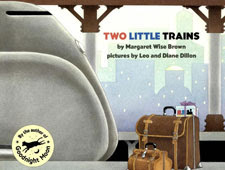 The book compares two trains -- a shiny, silver, and sleek real train and a little, black toy train as they both head West. I have really no idea what is going through my toddler's head as we read this book, but I think it probably helps him make sense of his new experience riding a train. Before we rode on a train, the only trains he knew about were toy trains. It's really neat to see the two trains depicted side by side in the illustrations, both traveling through similar situations, especially the rain and the bath shower. We are definitely going to have to try using a book as a tunnel for one of my son's trains, as illustrated on one of the pages. The text by Margaret Wise Brown was originally published in 1949 with different illustrations and uses the phrase "black man singing in the West," so the terminology is dated. We'll have to search for a copy of the original and see how the illustrations compare. I am a big fan of everything by Kevin Henkes. We will be reading back to school books this week because school starts on Thursday for us. I love wordless picture books - we'll have to look for this one! 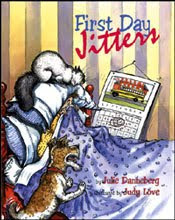 First Day Jitters is the book my second grader's teacher read the first day of school. He thought it was really funny. We'll have to check out Chrysanthemum. My list keeps growing of books to look for. All these sound very interesting. My daughter really likes the book Chrysanthemum! 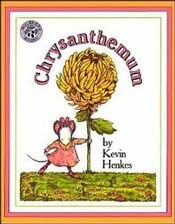 I'll second Christy, I love all things Kevin Henkes, and Chrysanthemum is one of his best. Thanks for joining WMCIR and sharing your picks! I hope your daughter enjoys her first school year! We haven't read any of the books on your list - Chrysanthemum seems to be always checked out in our library.